The recently-published Bogey Golfer Handbook doesn’t try to complicate the game, but rather attempts to help simplify and improve your game. According to the USGA, a male “bogey golfer” is a player who has a course handicap of approximately 20 on a course of standard difficulty. He can hit tee shots an average of 200 yards and reach a 370-yard hole in two shots at sea level. A female bogey golfer is a player who has a course handicap of about 24 on a course of standard difficulty. She can hit tee shots an average of 150 yards and reach a 280-yard hole in two shots. Written by PGA members Cary Davis and Jon Skaggs, The Bogey Golfer Handbook is dedicated to helping golfers lower their scores and make the game more fun, say the authors. “We know that for bogey golfers, shooting lower scores will continue to bring you back to the game you love,” suggests Davis. Skaggs says, “The most important shot in golf is the one after you missed your approach to the green; that’s right. It’s that simple. Thus, when faced with a shot after missing their approach to the green, most bogey golfers try to control distance by varying the length and/or speed of their full swing. For that to happen, The Bogey Golfer Handbook explains the ‘3 Go To Shot’ techniques that are easy to execute; when used with three different wedges, this gives you distance predictability. The alignment perfect putter is another improvement technique offered within the 132 pages of the Bogey Golfer Handbook. Other tools include access to instructional videos of the 3 Go To Shot techniques, demonstrations of shots being executed from various lies and distance, two putting videos, and e-mail support from PGA instructor Jon Skaggs. 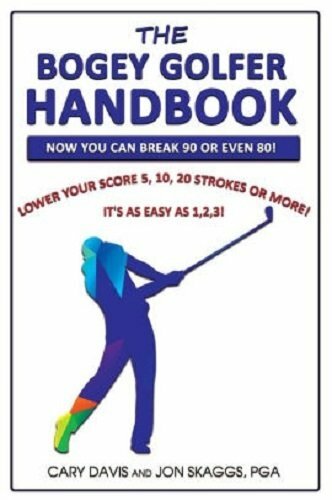 The Bogey Golfer Handbook retails for $14.95 and is available on Amazon here.